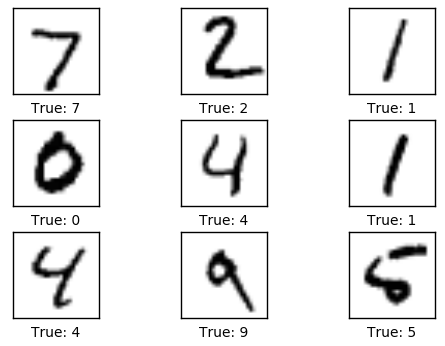 # We know that MNIST images are 28 pixels in each dimension. # Images are stored in one-dimensional arrays of this length. # Tuple with height and width of images used to reshape arrays. # Number of classes, one class for each of 10 digits. # Create figure with 3x3 sub-plots. # Show true and predicted classes. # Remove ticks from the plot. # Get the first images from the test-set. # Get the true classes for those images. # Plot the images and labels using our helper-function above.